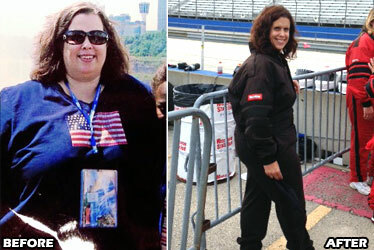 I lost a total of 182 pounds! I used to wear a size 6X scrubs and now I wear a medium. 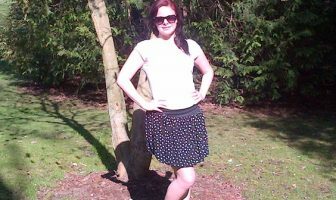 I have gone from a 24 pants size down to a size 12/14! I was overweight as a child and I was never really at the weight that I should have been. Then as an adult it got really out of control. I ate and ate and ate. I feel like I have been trying to lose weight forever. I have gone up and down with my weight for most of my life. 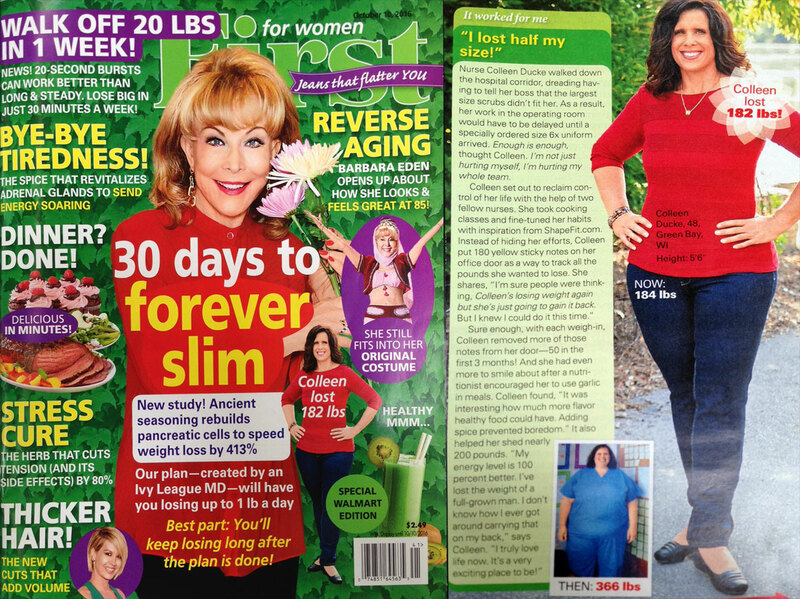 Colleen was featured in First for Women magazine! I decided to lose the weight for several reasons. I was never really able to participate in the activities that my daughter did as she was growing up. I took her sledding, roller skating and many other activities but I was never able to do them with her. I was just too overweight. I decided that I needed to start taking control of my life and now we do all kinds of things together. We bike, run, hike, climb rock walls, go to the trampoline park and do all kinds of fun and active things. I participate in all of them! 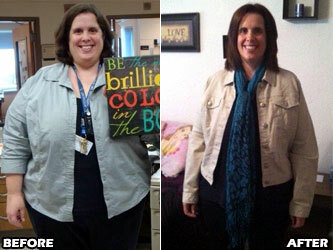 The other reason I decided to lose weight was because at my job we needed to start going into the surgery area. 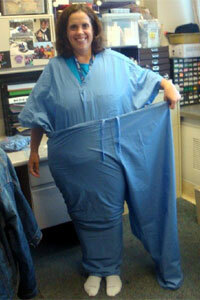 I was too big for any of the hospital scrubs. I had to special order size 6X scrubs to fit me! Because of this we had to delay getting started in the operating room. I felt like I not only let myself down but let my entire team down at work. Surprisingly, the most important changes I made to lose weight were not only eating healthy and exercising but doing a complete lifestyle change. I decided that if I was going to do it right this time around then I needed to look at everything. So, I stopped focusing on it being a weight loss journey and started looking at all the other areas of my life. I went back to school and got training as a Life Coach. I started sharing my story with other people to help them with their own struggles. I started to do everything that was out of my comfort zone. I got in a kayak and paddled, I wore a tank top to the gym, I stood in different places in my gym classes and I started cooking. I tried to challenge myself each and every day to get out of my comfort zone. I also surrounded myself with like-minded people. I looked for people who wanted to get motivated or who needed motivation and we worked together. We set goals (both long-term and short-term ones) and we accomplished each and every one of them. It has been amazing! The most challenging part of my weight loss journey has been learning to cook (I used to eat out all the time) and realizing that my journey to health will never be over. It will just continue to change and evolve. I used to think that when I hit my “goal weight” I was done. But I now realize that once weight loss is achieved then I need to learn to maintain it. Also, when I trained for big events I needed to learn to eat to maintain so that I didn’t lose muscle but also so I had enough fuel in my body to support all my exercise and training. It’s always something, but it’s awesome because it keeps it fresh and keeps me constantly having to challenge myself. I saw results within several weeks. My clothes felt looser and my skin seemed to clear up. I started taking regular pictures of myself and posting them on my office door so I could see the results as I lost weight. I also put 180 sticky notes on my door with the numbers 1-180 on them and as I lost each pound I would take down a sticky note as a sign of the weight I lost. I am a very visual person so it was great to watch the sticky notes disappear off my door. 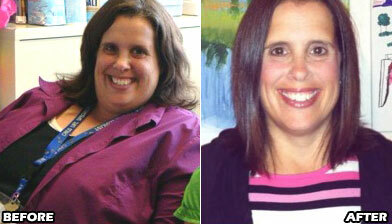 I started my journey to health on January 1st, 2012. I have been working on myself since then. I do have loose skin. At this point, I have just decided to accept it as part of who I am and say, “This is my body and I’m going to love it like it is.” If I had a lot of money I might consider getting surgery but I am not sure about that. I love me for me and my skin is part of who I am. It has taken me a long time to love my body and I can finally say I do, loose skin and all. I have been losing weight for 4 years. A very important factor for keeping it off is changing things up! Change up your food, change up your exercise routine, change up your goals. Try to accomplish them and then pick new ones! It’s also important to surround yourself with like-minded people. I choose to be around positive, happy and motivated people. 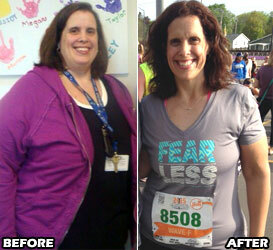 I love to help other people on their journey to health. It keeps me motivated to share my story with others. Helping, motivating and inspiring other people. I work with a lot of people who struggle with their weight. I love to see them celebrate their success. I love to see them pick goals and accomplish them. I love to teach them and show them that they can do anything they put their minds to. It’s so awesome to see other people get excited about their health. My life has changed completely! I am no longer the quiet, shy and introverted girl. I do public speaking events about my journey. I go up to people and ask them what their story is. I am outgoing and love to try new things. I love to help people. I love to set and accomplish goals. I just love life! Every day is a new adventure for me. My daughter is so thrilled that I am able to do so much with her and we can be outside doing fun things all the time now, which we were never able to do in the past. Find other people who are trying to do the same thing. Support each other. Find a fitness program that gets you excited about working out and that has other people who are also excited about it. Try new things! If one thing is not fun for you then just try another one. There are so many fun activities and programs to experiment with. 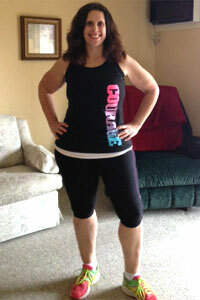 I love reading ShapeFit’s fitness articles, weight loss success stories and diet tips! Get comfortable being uncomfortable and start doing things that are out of your comfort zone! Change it up! 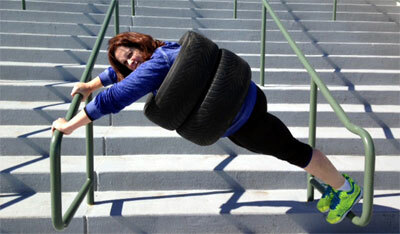 Try new foods, new exercises and meet new people. Experiment with new foods. There are so many options out there. Don’t eat things you don’t like. Find new healthy options that you really enjoy! Surround yourself with people who share your vision and support you in what you are trying to do. 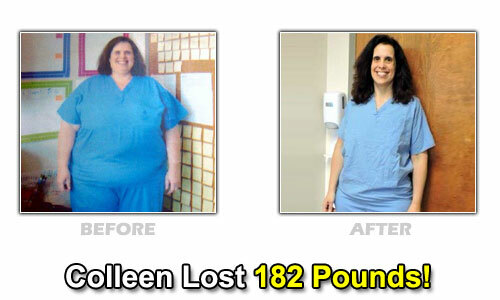 Colleen’s Weight Loss Eating Plan! Oatmeal with raisins, cinnamon and granola and some fruit. Grilled chicken, snap peas, quinoa and kiwi. Ground turkey or taco meat, salads, lots of veggies and a serving of fruit. I love all kinds of fruit! Greek yogurt, turkey sticks, cold sweet potatoes, apples, veggies and yogurt dip. Multivitamin, fish oil, vitamin D.
I do boot camp, core class, TRX, Insanity, HIIT to Kick and personal training. I love doing all of the classes! 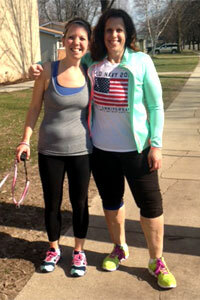 Cardio sculpt, spin class, biking outdoors and walking or running on a treadmill. I also love to hike and walk outdoors and do Zumba.